Kate’s mother was a childhood sexual abuse survivor who tried to help others; she was also physically and emotionally abusive to Kate throughout her childhood. There’s a rift in the family. Kate’s father took her away from her mother, believing Kate’s accusations of abuse; Kate’s younger sister Ruby (Ellie Ellwand) sided with mom and refused to leave, believing Kate made up or was at fault for her experiences. This is an issue play that’s not afraid to display those issues loudly and messily. It centres around the questions of whose experience is believed, whose version of events sees the light of day, and who has the right to tell the story. It also, while acknowledging the system that perpetuates abuse, demonstrates how easy it is for the cycle of abuse to continue, survivor becoming self-deluding abuser. 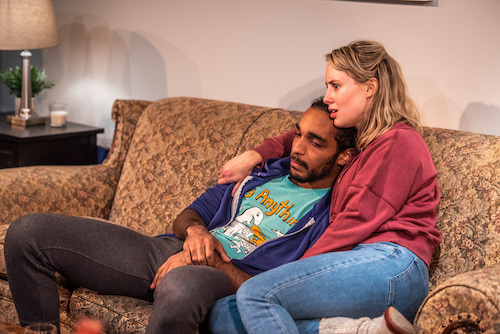 Directed by Sarah Kitz in an almost-claustrophobic configuration at Streetcar Crowsnest with audience on three sides, the play lets you look at the faces of other witnesses. It’s a fair bet that you’re going to see some uncomfortable or knowing looks over the course of the 100-minute evening. First, the couple’s relationship shows the moment-to-moment negotiation that comes along with personality disorders, where every line and motivation is second-guessed. It’s both exhausting and spellbinding to witness. Kyle, for example, is a woke gentleman, but one who keeps finding himself walking the fine line between support and paternalism. He hasn’t yet called his father out on reports that the older man used to hit on Kyle’s sisters’ friends. His inner conflict grows; you can see his desire to #BelieveWomen, but it’s easier to trumpet the philosophy than follow through when there’s a potential relationship of kindness and sensitivity to lose for actions he’s never witnessed. Kate, on the other hand, believes she has nothing to lose, and has followed through with a vengeance. Though Kyle is male, he’s also a person of colour, which leads to interesting shades in his discussion with white, blonde Kate of issues surrounding oppression and victimhood. Regardless, both live comfortably in a Leslieville apartment – a fact that leads to the biggest laugh of the evening. The issues explored in the play are amplified by the dialogue, which is extremely arch and stagy – you can practically see the lines of script floating above the actors’ heads. This is not necessarily good or bad, just a choice; it emphasizes the constant re-evaluation being done by the characters, the personas they’ve adopted, and the malleable nature of the truth. It does, however, stick out from the beginning, creating a layer of remove between audience and play, and highlighting the rapid-fire ideas rather than the characters. They do sometimes transcend this effect to feel achingly real, such as in a moment where it’s clear from Kyle’s sly, secret smile that he realizes that his constant jostling of puzzle pieces is irritating, but carries on regardless. Things get more heated and naturalistic when Ruby, Kate’s sister, arrives. The two duke it out verbally and physically, with the words cutting deeper than a slightly awkward physical fight. The opposing forces of need and hatred for each other war fiercely, as do their completely opposing perspectives of events. Moon writes their relationship acutely, taking us from wounded howling to pin-drop silence. Despite the quick and freewheeling dialogue, my guest remarked that she felt things went about 15 minutes longer than they had to, and that the script could use some tightening. While I agree to some extent, I found the ideas in the script fascinating, exceedingly timely, and sometimes even harrowing. What I Call Her isn’t an easy play to witness, but I’d call it a sign of a rising talent who has a lot to say. What I Call Her plays until December 8 2018 at Streetcar Crowsnest (345 Carlaw Ave). Shows run Monday – Saturday at 8:30 pm, with Wednesday and Saturday matinees at 2:30 pm. Tickets are $45-50 and can be purchased online, or in person.